Cu Lao Cham (Cù Lao Chàm) Island contains 8 small islands recognized by UNESCO as the World Biosphere Reserve, aka Cu Lao Cham Marine Park. It is an ideal destination endowed with biological diversity and marvelous topography of the mountain slopes. 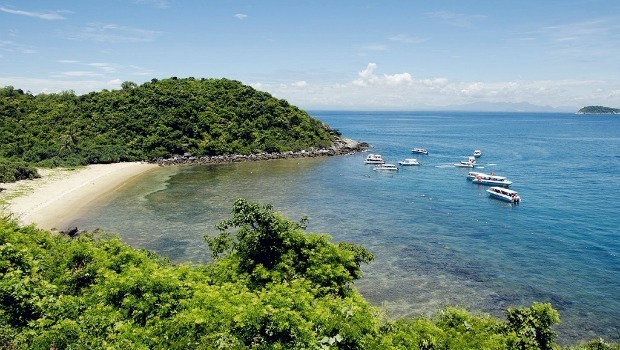 Despite being a rough gem, Cu Lao Cham, also known as Cham Island, has become an extremely attractive destination for many domestic and foreign tourists whenever coming to Hoi An. Cu Lao Cham belongs to Tan Hiep (Tân Hiệp), Hoi An (Hội An), Quang Nam (Quảng Nam) provine, about 15km away from Cua Dai (Cửa Đại) Beach. There are 8 small islands included in Cu Lao Cham, which are Lao (Hòn Lao), Dai (Hòn Dài), Mo (Hòn Mồ), Kho Me (Hòn Khô Mẹ), Kho Con (Hòn Khô Con), La (Hòn Lá), Tai (Hòn Tai), and Ong Island (Hòn Ông). Many tourists often visit this island group when having a chance to come to Hoi An (Hội An) in order to enjoy the tranquil, unspoiled beauty of the nature. Those tourists who are interested in visiting Cu Lao Cham can book a tour from Hoi An, which departs everyday in the morning to this island. This tour often includes transportation, guide and a decent meal on Cu Lao Cham. 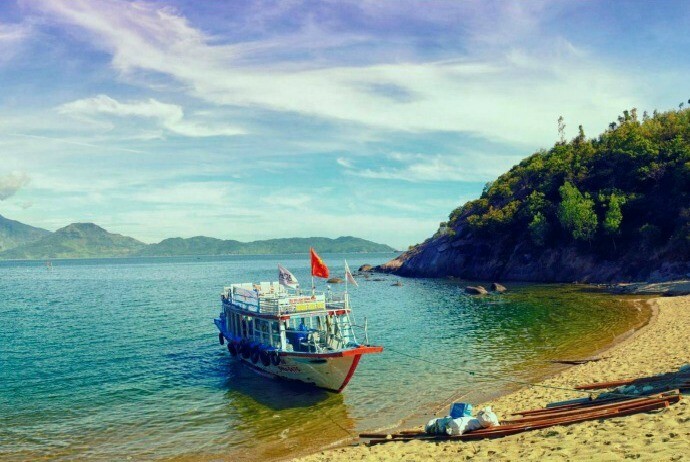 For those who want to explore this island on their own, they can take a taxi to Bach Dang (Bạch Đằng) pier. Normally, boats depart at 7:30 am. It costs about $2 / person. However, you had better make sure that you sit on the 2nd level in order to get the best view along the way to Cu Lao Cham. II. What Is The Best Time To Visit Cu Lao Cham? From March to August each year is the right time to visit Cu Lao Cham. At this time, it is warm, sunshine while the sea is calm. You should not go to Cu Lao Cham in the rest months because of storms. This island will become isolated. If you want to combine your trip with a visit to Hoi An ancient town, you should go in the full moon day of every lunar month. To participate in cultural beliefs of the inhabitants of the island, don’t skip festivals such as CauNgu (Cầu Ngư) festival (3th and 4th of April of lunar calendar) or Gio To Nghe Yen (Giỗ Tổ Nghề Yến) (Anniversary of a death of Yen field at 9th and 10th of March of the lunar calendar). Hoi An in Quang Nam province but the nearest airport is in Danang (Đà Nẵng) (about 30km away from Hoi An). Currently, the airlines such as Vietnam Airlines, VietjetAir and Jetstar are all exploiting these routes from Ho Chi Minh (HồChí Minh) City and Hanoi (Hà Nội) to Danang. From Hanoi and Saigon: there are trains to Danang. It takes about 14-20 hours to get to Danang from these two cities. Coach: there are different coach brands having the route to get to Danang from Hanoi or Saigon, such as Hoang Long (Hoàng Long), Hlink, Mai Linh, Thuan Thao (Thuận Thảo). It takes about 18 to 20 hours to travel from Hanoi/Saigon (Hà Nội / Sài Gòn) to Danang. From Danang, you can move to Cu Lao Cham by canoe or timber ships. With canoes, the fare is about 150,000 VND, sold at Cua Dai (Cửa Đại) or travel agents in Hoi An. It takes about 20 minutes to get to Cu Lao Cham. Departing time is from 8 am to 10:30 am. Timber ships: the ticket is about 30,000 to 80,000 VND if passengers bring a motorcycle. You should arrive at Bach Dang at 7 am or Cua Dai at 8 am each day to buy the ticket. The popular vehicle in Cu Lao Cham is motorcycle. You could hire them at hostels on the island with the price of 80,000 – 200,000 / day. Alternatively, you could visit the islands by boat with the cost of 500,000 – 1500,000 / turn. These boats also serve the diving service for watching coral. IV. Where To Stay In Cu Lao Cham? Accommodations here are mainly homestay, gathered at Bai Lang (Bãi Làng), Bai Huong (Bãi Hương). A two-person room costs about 150,000 VND. If you rent in retail, the price of one person is about 50,000 – 100, 000 VND. Note: Bai Lang is where timber ships land and Bai Huong is where canoes land. 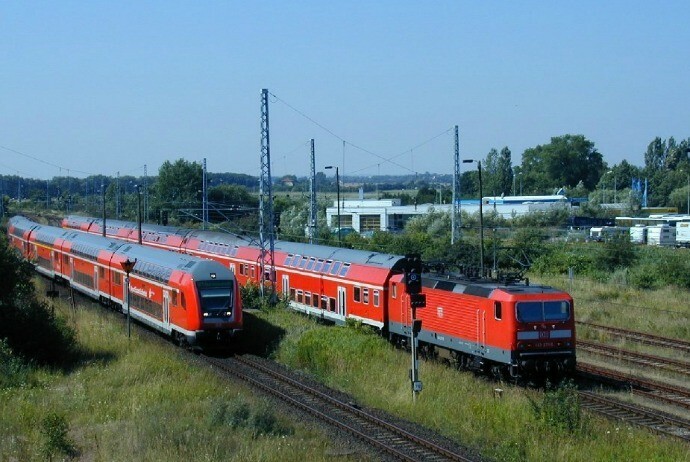 Depending on the moving vehicles, you could choose to stay at a hostel near the dock. In addition, if you want to immerse yourself in the nature, you could camp at Bai Ong (Bãi Ông), Bai Huong (Bãi Hương), Bai Bim (Bãi Bìm). Rent the tents of local people with the price of 150,000 / tent. 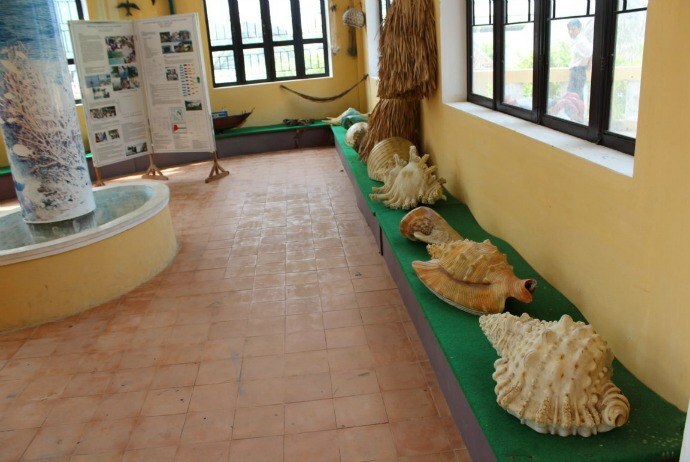 The first stop when visiting Cu Lao Cham is the marine museum Cu Lao Cham. Here, you could understand more about the history, tradition, festivities, and sea produce of this island, helping you have a panoramic view of the island as well as its people. Also known as Xom Cam (Xóm Cấm) Well, dating back about 200 years, Cham ancient well is located at the fork of the concrete road of Xom Cam. 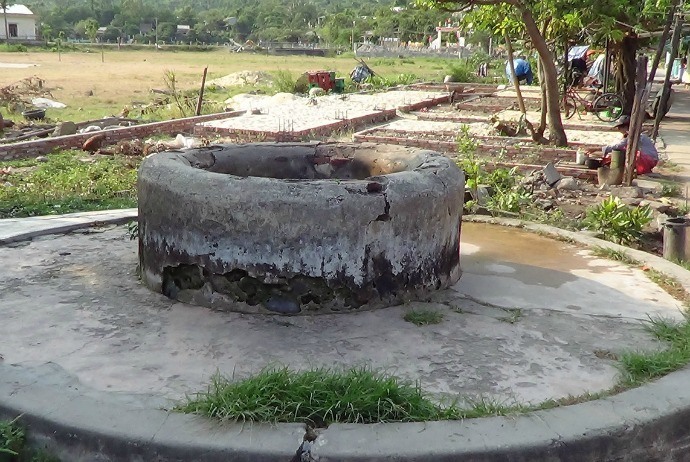 The structure of this well has typical features of other Cham (Chăm) wells in Hoi An. Local people ladle water in this well for the use of their daily activities. Built in 1758 at the foothills of the western area of Hon Lao(Hòn Lao) island, Hai Tang (Hải Tạng) pagoda is one of the most famous pagodas in Hoi An. Inside the pagoda, there is a horizontal lacquered board, parallel sentences, monumental statues and a large bell. This is where local people and traders go to pray for Buddha and wish for being blessed on the way to do their business. Visiting Cu Lao Cham, tourists cannot skip Tan Hiep (Tân Hiệp) market. Many people also call this as Cu Lao Cham market, located right at the dock area. There are forest and sea specialties and souvenirs sold here. Tourists often buy “muc mot nang” (mực một nắng) (dried squids) for their family and friends as a gift. In the market, you can bargain but just a little bit because sellers do not rip off so much. 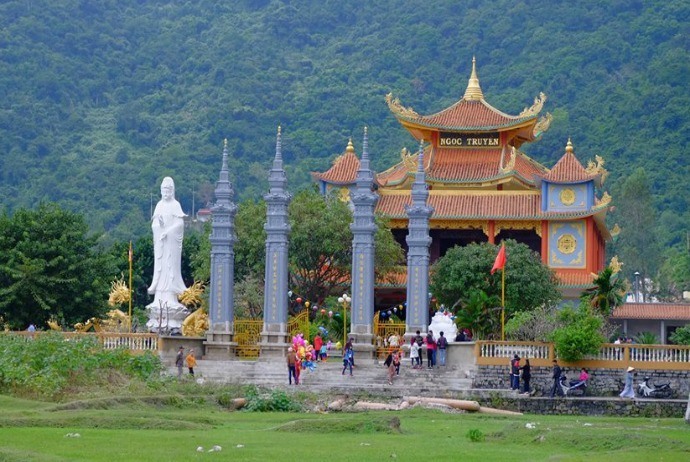 Located in Bai Huong (Bãi Hương), Yen Ancestor Shrine was built completely in the early 19th century in order to worship the ancestors of Yen field. Every year, in 10th of March of the lunar year, local people and those people who exploit cozy net hold very solemnly in order to prepare for a new exploiting season. In addition to Yen (Yến) island, Da Chong (Đá Chồng) beach is also an attractive destination that many tourists love to stop. These are two popular attractions in Cu Lao Cham. Those people who like to immerse themselves in the turquoise and cool water, Bai Ong (Bãi Ông), Bai Xep (Bãi Xếp) and Bai Lang (Bãi Làng) beaches are really ideal. If you have time, don’t skip visiting Nest Plantation, Xom Cam, Yen Island, Bai Lang beach before coming back to Hoi An. Cu Lao Cham themselves are mainly forested and mountainous, and fringed by protected and quiet white sand or rocky beaches. 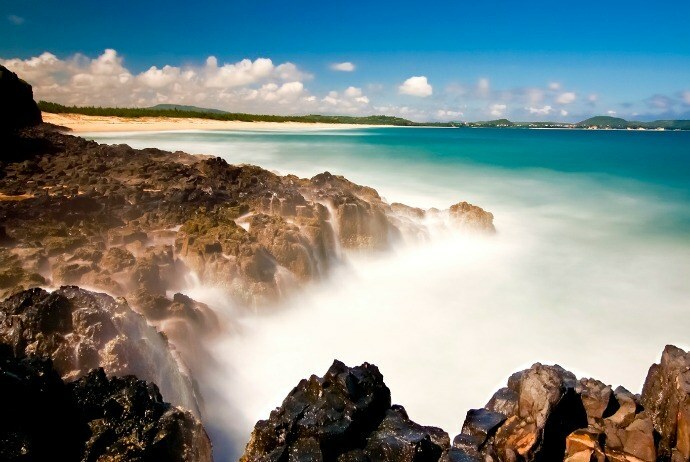 These beaches are scattered with different-shaped stones, creating the island’s diversity of geomorphology and strata. Those people who love marine activities, there are some facilities for common water sports, such as water skiing, swimming, paragliding, kite flying, kayaking, scuba diving and boat racing. Having primitive landscape, this island is really ideal for swimming, camping and scuba diving in order to enjoy the beautiful marine life and corals. In Cu Lao Cham, there is a collection of sea grass, marine algae, sea creatures and particularly coral reefs. Travelers are expected to see a beautiful marine world with a variety of colorful fishes, mollusks, and lobsters under the surface of clear water. I bet that your trip to Cu Lao Cham will be one of the most interesting trips in your lifetime. In Cu Lao Cham, you should not use plastic bags because people here do not like it. So, before entering onto the island, you should not carry with any plastic bag. Wear full of personal documents for easy motorbike rental. When snorkeling for watching coral reefs, you should not break or bring coral into the mainland. The climate is hot, so if you move in the daytime, bring sunscreen and water.